Fans of WWE will be able to see some of their favourite Superstars perform live in Aberdeen at the AECC on Mon 7 November. Stars hoping to make a big impression on the canvas include Roman Reigns, AJ Styles and Bray Wyatt. World Wrestling Entertainment is the world's biggest wrestling federation and the ultimate in 'sports entertainment' and fans are urged to expect 'all the drama and energy of a rock concert, in a fun, lively and exciting environment.' WWE shows feature storyline-driven matches, incredible aerial moves and high flying action performed with tremendous skill and athleticism by their much-adored stars (also including The Usos, New Day, The Wyatt Family, Becky Lynch and Naomi). Billed as 'the ultimate in family entertainment', there will likely be plenty of action between bouts. 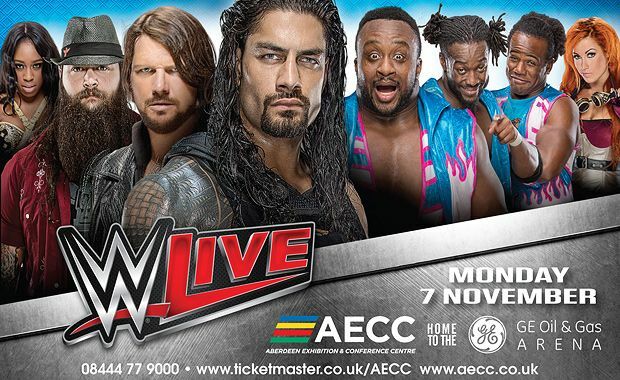 WWE Live is at the GE Oil & Gas Arena, Aberdeen, on Mon 7 Nov. Tickets go on sale 9am, Fri 10 Jun. The ultimate in 'sports entertainment' as the real deal WWE superstars of US wrestling bring the pain to the UK.